Cameras flickered as President Trump and his advisers bowed their heads in prayer. "Our kind Father in Heaven, we're so thankful for the opportunity and the freedom that You've granted us. We thank You for a president and cabinet members who are courageous and willing to face the winds of controversy in order to provide a better future for those who come behind them. We're thankful for the unity in Congress that's presented the opportunity for our economy to expand so that we can fight the corrosive debt that's been destroying our future. And we hope that that unity will spread beyond party lines so that people will realize that we have a nation that is worth saving, and recognize that nations divided against themselves will not stand. In this time of discord, distrust, and dishonesty, we ask that you will give us a spirit of gratitude, compassion, and common sense. Give us the wisdom to be able to guide this great nation and the future. 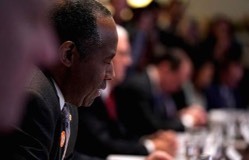 We ask in the name of the Father, the Son, and the Holy Spirit," Carson prayed. The public prayer comes at a time when President Donald Trump is celebrating the success of the GOP tax bill, claiming it fulfills his long-held campaign promise to repeal Obamacare. "We had [an] historic victory for the American people," Trump said during a Cabinet meeting Wednesday. "Obamacare has been repealed in this bill." The bill repeals the individual mandate found in Obamacare, which forces Americans to purchase health insurance and penalizes those who do not. President Trump also promised more money in the hands of working Americans in the Middle class. "The heart of our bill is a tremendous amount of relief for the Middle Class including a doubling of the child tax credit and a nearly doubling of the standard deduction," he said. The bill initially passed both chambers, but the House had to vote again because its original version contained provisions that violated Senate budget rules. Despite the delay, President Trump says the bill will be signed before Christmas.